The Mara region of Tanzania lies to the west of the great Serengeti National Park. It is estimated that this is home to over 1.5 million Tanzanians. I’m reliably told that various government departments are working on strategies to bring greater economic activity and prosperity to this region over the next 5 years, to cater for what will be more than 2 million citizens resident there by 2015. Clearly the proposed commercial road linking Musoma on Lake Victoria, via Loliondo, to the hub city of Arusha sits at the heart of government plans. The crisis lies in the planned routing of this road through the pristine, iconic Serengeti. To try to seek out solutions, one needs to understand several dynamics. Fortunately the Christmas season brings together old friends and I had the privilege of sharing a few drinks with an old business associate who has some extensive, recent experience in logistics and international trade in Kenya and Tanzania. As my home city – Durban – is Africa’s largest and busiest port, it is also home to many multinational freight and logistics companies – my friend’s business being but one of them. Essentially, there are 2 key ports for international trade in Tanzanian produce. Dar es Salaam on Tanzania’s southern coast and Mombasa, on Kenya’s southern coast. Central and southern TZ goods (and those of her neighbours) route via Dar. Much of northern TZ routes via Mombasa. Now look at the regional map I’ve laid out and see the geography and potential trade routes for economic produce for and from the Mara region and one begins to understand the real challenges facing government and her private sector. In addition, you should be interested to know that Mombasa, as a port, offers many more benefits to shippers than does Dar es Salaam. Through the handling of a range of mineral products – cement, steel, soda ash, flourspar, etc – it offers greater versatility for a range of such materials. Through its agricultural produce handling, again there is wider experience in more types of goods for transshipment. Another very key logistics factor is that Mombasa offers more frequent and more diverse options for salings than does Dar. 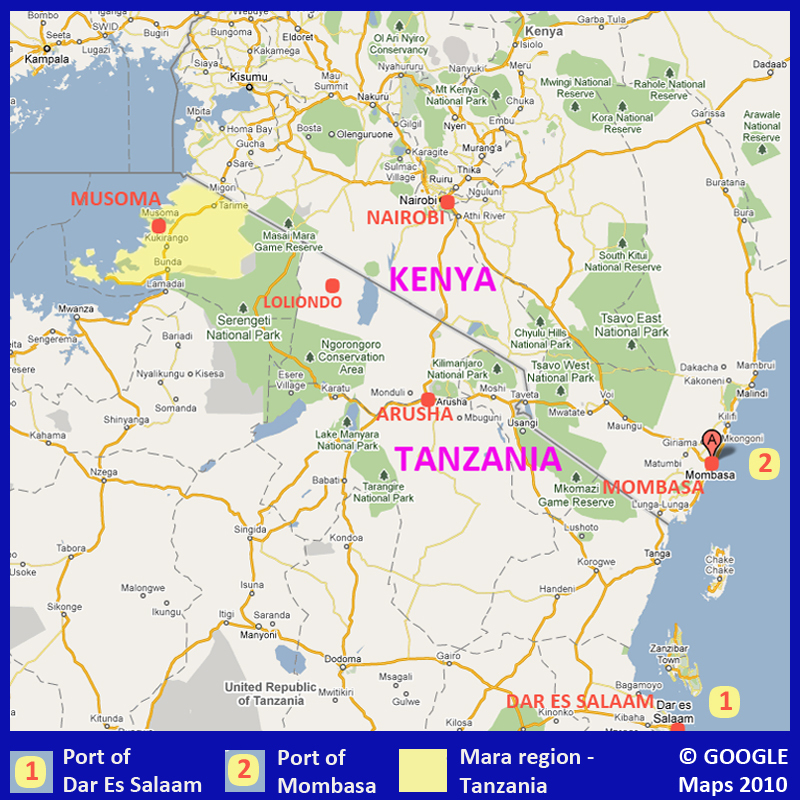 Hence, Mombasa is somewhat a key regional port for northern Tanzania, and that includes produce of Mara origin. Let’s ignore the eastern region of the Serengeti for the moment – i.e. Loliondo-Ngorogoro-Arusha. That’s easy to understand, since any goods or produce for or from that region requiring international logistics has no bearing on the Serengeti. However, Mara is effectively an island. And soon, there will be 2 million people semi-cut-off from trade and commerce. In other words, a key life-blood to socio-economic development for their peoples. I get really peeved when an American TV journalist – from NBC Today – produces a piece that centres on minerals for cellphones produced in China, without little other research or understanding of this region’s economy. We need to accept that there are some valuable minerals to be found in the Mara region and commercial development will proceed in the years ahead. I’m not discussing ethical mining, I’m simply stating an economic fact. The people of Tanzania have every right to exploit their rich natural resources in this sector, to the advantage of their nation and their peoples who find work and wealth in such projects. 3. Did you know that tobacco growth (leave out the dangers of smoking!) in this region is becoming increasingly important and 2009 produced some really positive growth in plantings, sales and related-trade for this sub-regional economy? 4. Did you know that there are plans to develop more Arabica coffee bean trade out of Tarime? 6. Have you studied how abysmally poor the road infrastructure in the Mara region is? If not – please Google map it. Without a doubt, this must be urgently remedied by the state. DID YOU FACTOR IN SOME OF THESE THOUGHTS INTO YOUR STRONG VOICE AGAINST A SERENGETI COMMERCIAL ROAD ? I fear not, since I’m also still learning and thinking, and I spend a lot more time on this project that most people I know. SO – HOW DO WE MOVE FORWARD ? Clearly, one can understand local voices saying the world cares more for wildlife than they do for people. Especially when thinking simply about the future prosperity and wellness of more than 2 million Mara residents. If you look carefully at the map with it’s potential routes to ports and even with some new southern road development, it makes regional economic sense for Mara’s private sector to rely on “northern” route options. So let’s say – NO commercial trade through the Serengeti. Then producers and traders have one of 2 options – north via Nairobi or south via Singida or a new route more northerly than Singida. B. South via Singida – roughly speaking it could almost be quicker to route goods to or from Arusha via Nairobi, but yet it probably offers much the same transit time to Dar es Salaam as it would be the case for Mombasa, even though the Nairobi route is shorter. However, let’s not forget Mombasa’s far more competitive port advantage, given the range of produce from Mara? Hmmm? Now that I’ve triggered some critical thinking for readers, hopefully you might start to see that the only REAL solution for the future economic prosperity of the Mara region lies in the leaders of Kenya and Tanzania sitting down and discussing some meaningful bilateral co-operation, where a collective of smart minds and key sector role-players engage constructively. It has just been announced in Tanzania that Africa’s first One-Stop customs and border control post is to be established between Arusha and Nairobi at Namanga, in terms of the East African Community economic treaties. IF one assumes that government MUST develop proper commercial roads east (Loliondo-Arusha) and west (Musoma-Mugumu) of the Serengeti, and IF Kenya is committed to protecting its famed Maasai Mara eco-tourism and biosphere from threats to the great migrations, then surely some smart outcomes can be devised through some northern Serengeti-Mara new road network. If one then looked at 2 options – upgrading roads north of Singida in the south for better trade access or north of the Maasai Mara National Park in Kenya, I’d say the Kenya bypass would be infinitely more cost effective and add more road infrastructure to their south. I know the “southern route” proponents promote the thinking that a road network in this region serves more people economically. Well, the harsh reality is that it does nothing for the people of Mara. An economic imperative is the development of these affected people, especially since the Kuria of Mara (who number several hundred thousand) surrendered some of their ancestral lands to the formation of this national park. And what do they have to show for it today? A few thousand direct and indirect jobs via eco-tourism? Given this overall thinking, it makes far more economic sense for Tanzania and Kenya to expand trans-frontier development in seeking solutions to protect the sanctity of the priceless Serengeti-Mara eco-systems. I referred to Richard Engel’s TV report on the Serengeti on NBC’s Today. I have lodged an editorial compliant with NBC over incorrect reporting and am waiting a response. This misinformation is now spawning blogs and posts across the internet that utterly incorrect, technically, scientifically and economically. Let me introduce some real serious information you SHOULD be digesting before you do your OWN further research. I must admit I couldn’t find anything of substance on Coltan in Mara through my own online digging. When I saw this earlier, I mailed a contact I now have in Dar – he’s a specialist in mineral shipping – so deals with major companies involved in Central and East African mining – gold, copper, sulphur, nickel sulphide, phosphates, etc. “Spoke to a geologist friend of mine in NW TZ. His interest is in the region west of the Mwanza-Shinyanga road to the Burundi border. He thinks it most unlikely there is an deposits to obtain coltane by-products from the geology of the Mara region. He believes if there are deposits of tantalum-niobium there is far more likelihood of this being in his area, given that the majority of the known regional deposits are in the north and south Kivu areas of east DRC, Rwanda and Burundi. He does point out that they are very small in world terms and really only worked by small-scale alluvial diggers/panners. Another contact also working in the same area did some work for Lake Victoria Mining Company (LVMC) a couple years back. He thinks they might be prospecting there under one of their many licences and reckons he would have heard from frinds there if they found something viable. I’ll keep you posted if I find out more. http://www.suite101.com/content/serengeti-national-park-threatened-by-proposed-tanzanian-highway-a326126 – and written by someone who has a master’s degree in history, so should understand FACT and FICTION~! Michael, with due respect, you are an historian. The thrust of your writing here – i.e. regional mining – is clearly outside your area of expertise. This piece has many innuendos and is full of hyperbole. Frankly, as an African, it insults me and would do to many of my fellow brothers and sisters. You build your “argument” around protecting the iconic Serengeti from commercial road development based on some ill-considered and very poorly researched material in respect of mining, and specifically “coltan”, in Tanzania. I suggest you visit the website of global authority on this matter to gain some semblance of scientific and geological knowledge on so-called “coltan”, namely the Tantalum-Niobium International Study Center, and then speak to an internationally respected geology professor, as I have done, who understands “rare earth elements, metals and oxides” to gain some simple ABC lessons. 4. “Under the guise of connecting Tanzanian communities, the proposed highway will vastly benefit commercial mining interests at the expense of a UNESCO World Heritage site.” This is utterly fallacious, simply speculative and without and credible source of substance and highlighted above, for the reasons I’ve given above. If you wish, I could add another 1000 words here, supported by wide and additional research of independent global stature. Whilst I am personally 101% against any kind of commercial road whatsoever through this pristine biosphere, and I am also concerned that some mining interests may add pressure to government for better roads from Lake Victoria to Arusha, I am not foolish enough to make such spurious and baseless comments as you have done here. And as NBC’s Today programme did. “I get really peeved when an American TV journalist – from NBC Today – produces a piece that centres on minerals for cellphones produced in China, without little other research or understanding of this region’s economy. You are a Master’s graduate in a subject (history) that relies 100% on credible research and sources, but yet you sink to such fallacious commentary via innuendos and hyperbole. Hmmm? Better you stick to your day job and stop making unfounded direct, or indirect, allegations about Africa and her nations and people! Hope that better informs everyone why I have lodged an objection with NBC’s Today and news dept. Brian, I agree with you in NO COMMERCIAL TRADE THROUGH SERENGETI and the need of KENYA-TANZANIA BILATERAL CO-OPERATION. You’re writing about Mombassa and Dar Es Salaam harbours. What about the planned harbour in Tanga (Tanzania)? Do you know anything about uranium around Serengeti? A Tanzanian who lived in the region but now is living in USA told me some months ago there is uranium there waiting for a better road network. Anyways I’m very worried about what Tanzanian Authorities are saying about there are paved roads crossing national parks in other places and countries and wildlife are still present there. Such statements are a clear sign they are not aware about what the great migration is, what the Serengeti-Mara ecosystem is. The people of Tanzania have every right to exploit the rich natural resources that there are in the underground of Tanzania and to develop their economy and improve their way of life, OF COURSE!! !, but nobody have the right to destroy a nature treasure. Till now H.E. Jakaya M. Kikwete has showed his main interest isn’t people living east and west of Serengeti. c. OTHER infrastructure development – a massive container handling depot is being planned about 25kms west of Dar, that will be fully integrated with the Zambian and northern railway line systems. This is because there is not sufficient land-space in the current port. I think early work starts later this year. d. NEPAD – DSM PORT investments – I’ve also now had sight of a formal presentation given to NEPAD (African Union) investment arm over TZ’s long-term infrastructure development plans. Frankly, I think any waffle about a road through the Serengeti linking eastern DRC, Rwanda, Burundi, etc linking to Mombasa is absolute codswallop and a conspiracy theory. e. URANIUM – according to an independent geologist and to someone in the geological survey office in Dodoma that I spoke to, there is some gold and silver deposits under the park, more in its south-western areas. There seems to be some uranium (which often occurs where there is silver, apparently) but the prospect of this being commercial in any way is hugely remote. Mining and processing uranium is a massive and costly investment exercise and apparently there are hundreds of deposits worldwide that have not been mined yet because it makes no economic sense. As was said to me – if the Chinese or any other investors want uranium – there are plenty of better resources than TZ’s small deposits near and under the Serengeti. Dodoma geo-survey office is quite clear – any mining in the Serengeti is illegal, in terms of an act of parliament and this cannot be changed by anyone, except Parliament, not even the President. I haven’t verified this fact yet. Thank you very much Brian for your accurate information. « Cloves of garlic and African coffee beans: do they dis-empower Mama Afrika?